The Upper Truckee is the largest river that flows into Lake Tahoe, and also the biggest producer of sediment. The river has been negatively impacted by historic disturbances and modern development and has been targeted for restoration. California State Parks owns two contiguous units along the Upper Truckee River . The property that is now Washoe Meadows State Park (WMSP) and Lake Valley State Recreation Area (LVSRA) was acquired to protect wet meadows and floodplain habitat in the mid 1980s. The golf course was constructed on meadow floodplain area in 1958-1962. Because the golf course already existed, the area was divided into two units to provide for the continued operation and management of LVSRA for golf recreation. The park units were subjected to a number of disturbances prior to acquisition by California State Parks. The glacial terrace was mined for gravel (borrow pits), the meadows were grazed, sewer lines, railroad grades, roads and dirt race tracks altered drainage patterns and disturbed vegetation. The forests were logged, leaving a myriad of roads and skid trails. Lack of natural fire coupled with drought and infestation have also led to decline in forest health. Prior to the 1940s, this section of the river was straightened, leading to down-cutting, loss of connectivity to the floodplain and degradation of habitat. The river is still adjusting to this disturbance today as evidenced by unnaturally high erosion rates. The golf course was built on the previous floodplain/meadow area in 1958-1960, further degrading habitat as several of the holes are located along the river’s edge. State parks has completed, or is in the process of doing, a variety of resource management and restoration projects in these units. Golf course fairways extend to the edge of the river resulting in lack of a buffer zone and no riparian habitat. This photograph shows eroding banks and failed rock stabilization along the Upper Truckee River. 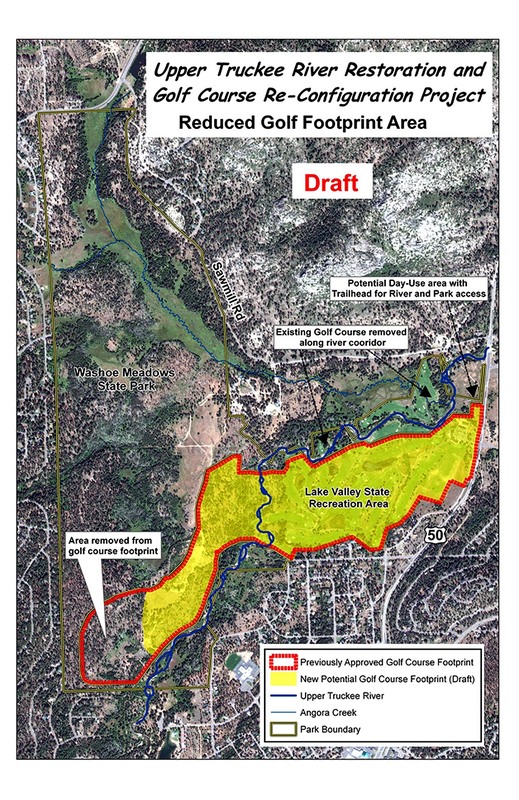 The purpose of the proposed project is to restore natural geomorphic and ecological processes to this section of the river and to reduce the input of nutrients and suspended sediment to Lake Tahoe, while still providing a broad array of recreation access including activities such as hiking, biking, and golf recreation (18 hole regulation). The approved project (alternative 2 modified) would relocate several golf course holes away from the rivers’ edge and out of the floodplain to less sensitive land west of the river. The river will be restored to a meandering pattern with connectivity to it’s floodplain. Areas where golf is removed from the floodplain would be restored to meadow habitat. A recreation plan will be developed to increase access to the river and regional trail connectivity. Since the EIR approval, CSP has continued to refine the river and golf course designs. CSP has revised the layout of the restored river and relocated golf course holes to reduce the number of holes to be relocated from up to 9 to just 5 holes (see map). This will reduce the number of holes moved west of the river and will reduce construction costs, while still allowing for major improvements to the river and floodplain, retention of an 18 holes golf course and increased opportunities for other recreation such as hiking, fishing and biking. 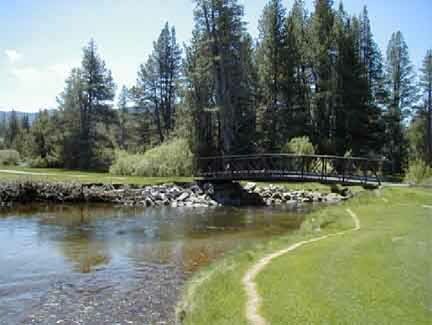 Relocation of the golf holes that are presently adjacent to the river opens up a corridor that could be used for various types of recreation, provide river access and connect users from Highway 50 to the western side of the park. The plan could include elements such as new trails, ADA routes, fishing access, cross-country skiing trailheads and parking, but the details will be determined through a public planning process. California State Parks will launch a planning process for the reconfigured WMSP to determine recreation uses and trail systems. This planning process will be in coordination with the Meyers community Plan Update. River Ecosystem Restoration with Reduced-Play Golf Course: Restore the river and reduce the golf area, with all golf on the east side of the river. Boundaries between WMSP and LVSRA would be adjusted to reduce size of SRA. Recreational development of reconfigured WMSP may be considered under future planning and studies. River Stabilization (in place) with Existing 18-hole Regulation Golf Course: Stabilize existing river banks and keep golf course unchanged. No change to boundary, LVSRA General Plan would be amended to allow stabilization. Recreational Development of WMSP may be considered under future planning and studies. River and Meadow Ecosystem Restoration / Decommissioned Golf Course : Restore the river and remove the golf course. Parks is also investigating the potential for off-site relocation of the golf course. The existing general plan would be repealed. A new planning process for both units would be undertaken to provide recreational facilities. California State Parks has an ongoing forestry management program to improve forest health and reduce fire hazard . Also ongoing is the road and trail program to decrease erosion and impacts by improving drainage and layout of routes to be kept and restoring areas where routes are to be removed. One of the old borrow pits was restored and two restoration projects were completed along Angora Creek to restore natural function to both the stream and surrounding meadow habitat. California State Parks has also installed a number of spot treatments to stabilize badly eroding banks of the Upper Truckee River, but with little success since the problem is systemic and requires a geomorphic approach. More recently, California State Parks has started a riparian hardwoods improvement project to restore and enhance aspen stands and other riparian vegetation by selectively removing invading conifer forests. Besides the ongoing forestry and road projects, state parks has implemented a number of stream and habitat restoration projects.